EPA researchers are working with partners in the Narragansett Bay watershed to advance the understanding of nutrient pollution effects on the health of lakes, streams, and estuaries. Narragansett Bay, Rhode IslandA million dead fish Exit washing up on shore is a pretty strong indication that the health of a water body is compromised. That is exactly what happened to part of Narragansett Bay, a 147 square mile estuary sandwiched between Rhode Island and Massachusetts, in August, 2003 Exit. The immediate culprit (PDF) (34 pp,793 K, About PDF) for the local fish kill was a sharp drop in dissolved oxygen levels. Dissolved oxygen levels fluctuate naturally due to variations in the weather and geology, but these levels can drop drastically—and dangerously—with the boom and bust cycle of plankton growth and decay sparked by excessive nutrients flowing into the Bay from surrounding land. Since the 2003 fish kill, the state of Rhode Island legislators have supported taking actions to stem the flow of nutrients and bacteria in sewage reaching the Bay. The solutions involved making major infrastructure investments Exit to capture stormwater that could result in sewage overflow and also included wastewater treatment plant upgrades Exit to remove nitrogen and phosphorous from the water. A number of actions in Massachusetts and Rhode Island, taken to improve the overall health of Blackstone River (which empties into the Bay) and the Narragansett Bay ecosystem, are also presenting a unique opportunity for science. EPA researchers are looking at the Bay and how it responds to decreasing pollution levels to gain a better understanding of nutrients, how they impact the environment, and how changes in nutrient levels will either degrade or improve water quality and the aquatic ecosystem. “We have already seen major reductions in sewage overflow. I would say that within the five-year period of this research demonstration project, we will see dramatic reductions in nutrient loading—more dramatic than any other estuary in the country—and we have the opportunity to observe how that affects a very significant and valued resource,” says lead scientist Hal Walker, Ph.D., of EPA’s Narragansett Bay Demonstration Project. 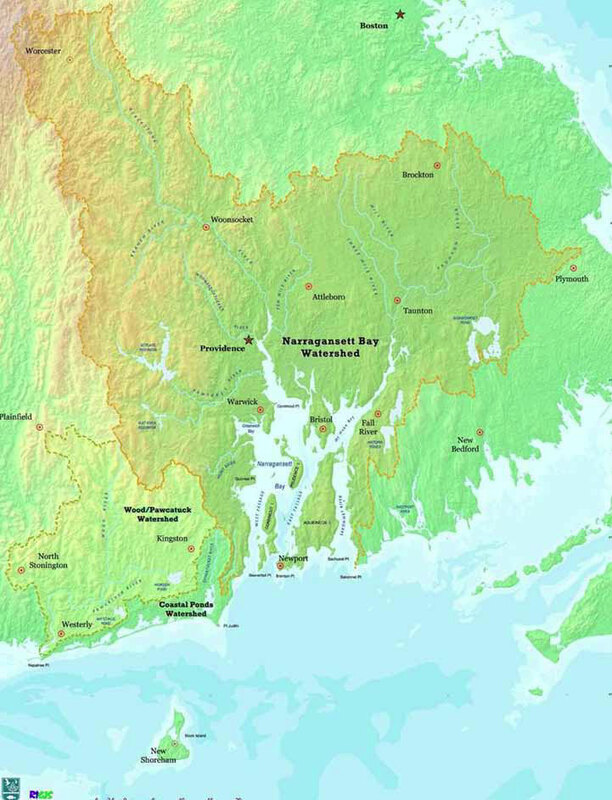 Narragansett Bay’s watershed is one of the most urban in the Northeastern U.S. This means that more than one half of the Bay’s nutrient pollution was coming from urban waters—sewage overflow or city water passing through treatment facilities—draining into the Bay. Nutrient and bacterial contamination in that water leads to ecosystem degradation, health risks to seafood consumers, and hinders commercial and recreational uses. But with the right infrastructure improvements, much of the urban water can be captured and treated before it reaches the Bay. The Demonstration Project has three main parts: 1) a retrospective analysis of environmental changes affecting water quality and how decision makers (state environmental agencies) have responded to those changes from 1900 to present, 2) using that analysis in computer models to determine how the environment is responding to current nutrient levels and to calculate what would likely happen in the future if nutrient inputs to the Bay are reduced from a variety of sources, and 3) developing ways to share study data, information, and scientific knowledge with environmental governance institutions that have the authority to adjust policies needed to achieve solutions. In this manner, Walker’s team is developing the methods for communicating to key governance entities operating at Federal, State and Municipal scales in ways that are transferable to other parts of the country. “A lot of people are looking at this as a very, very interesting case study and the lessons to be learned here should be applicable elsewhere,” says Walker. The Narragansett Bay Demonstration Project began in early 2012, and the resulting information and decision-informing tools are expected to be delivered in 2017. A demonstration project such as the one EPA researchers are conducting in Narragansett Bay requires a lot of effort in a lot of places, and the Agency has teamed up with numerous partners from state and federal agencies (USGS, NOAA), local universities, and environmental groups to maximize the efficiency, breadth, and impact of the project. For example, one collaborator is the Rhode Island Bays, Rivers, and Watersheds Coordination Team, a commission of seven state agencies established nine years ago “in support of our aquatic environments and their human uses,” according to their website. The models and decision support applications will take into account economic concerns (costs) of nutrient management as well as the economic benefits expected by a restored Bay ecosystem. The collaboration goes two-ways. Not only will EPA help develop decision-support tools for the state, but the Rhode Island Department of Environmental Management and local university partners have years of research data and historical records to share. “There is a rich history here of estuarine science modeling that [EPA researchers] are able to dig into, as well as current baseline environmental monitoring that Rhode Island has funded, that Narragansett Bay Commission Exit helps with,” says Colt. Another EPA partner is Watershed Counts Exit, a project collaboratively managed between the Narragansett Bay Estuary Program Exit, New England Interstate Water Pollution Control Commission Exit, and the University of Rhode Island Coastal Institute Exit. The goal of Watershed Counts is to engage a wide diversity of partners in the watershed to develop indicators of environmental health that everyone agrees to and understands. EPA researchers have been active on Watershed Counts workgroups pertaining to water quality, and the foundation has been laid for future exchanges of information and tools. For more about how EPA researchers form partnerships and collaborations to explore ways to address nutrient pollution see “Partnerships to Protect Chesapeake Bay” in this issue.